Power System Care is the PUP that uses misleading techniques to prevent removal. Use Reimage to locate malicious components and get rid of them faster than with uninstall instructions. A full system scan blocks virus reappearance and prevents traffic to malicious domains. 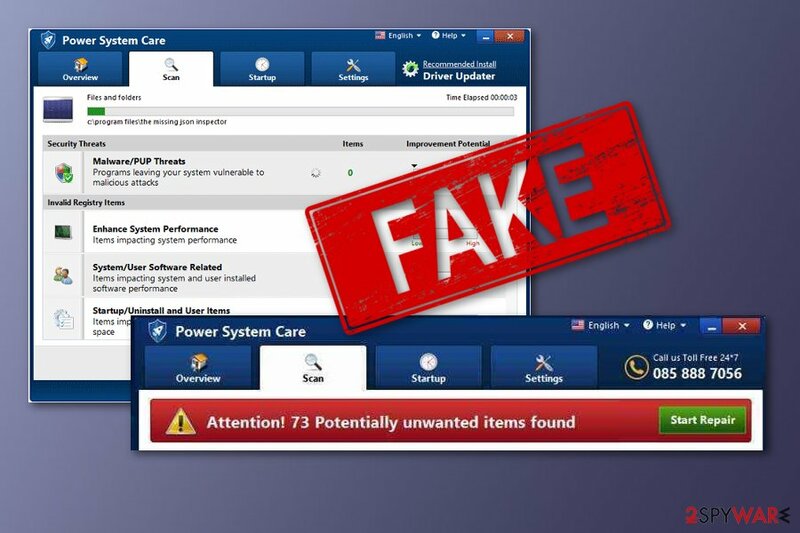 Power System Care is a fake computer cleaning application which bombards the computer screen with false warnings that alert about numerous computer infections. Power System Care is another system tool which appears to be fake and shows false computer scan results when installed. This potentially unwanted program comes through other original applications with a purpose to gain income from naive users. 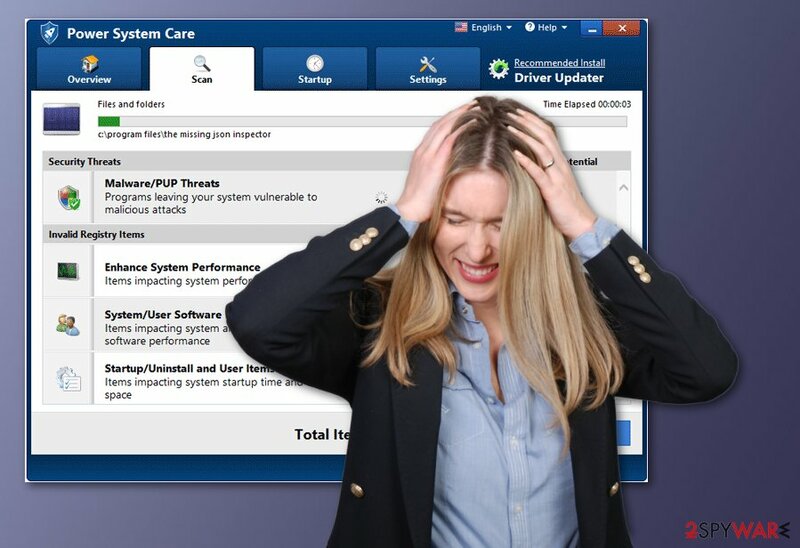 First of all, Power System Care virus imitates a computer scan and starts bombarding the computer screen with numerous warnings about computer infections and other vulnerabilities. However, such information is all false as the developers of this program seek to trick users by performing this type of activity. Moreover, the licensed version of the fixing program is given as the only one which can fix the issues which is also a false thing. Mac Clean Pro, Super Clean Pro 2018, Perfect PC Cleanup, etc. You are offered to purchase the licensed version of the fake fixing program. If you ever get Power System Care system optimizer installed in your computer, note that you will receive many warnings about dubious computer vulnerabilities and infections. However, we can ensure you that there are no problems in your computer system that are related to the dubious program. You can check that by installing a reliable antivirus program and performing a full system scan with it. There is no need of paying for the licensed version as it will not bring any results. The system tool will just imitate the fixing process even though there is nothing to be fixed. We recommend performing the Power System Care removal by using strong and reliable anti-malware tools. Another suggestion would be to use a program such as Reimage to repair the damage that was done by the fake system optimizer. You need to remove Power System Care virus as if you don't, this fake system tool will keep on displaying numerous warnings frequently and you will be facing annoying pop-ups. We suggest using the automatical elimination method as it is more trustworthy and effective. However, if you prefer the manual one, you can find some guidelines below this article. Power System Care - a fake system tool which tries to trick users that their PCs are infected and need cleaning which can be done by purchasing the license key for the offered program. According to IT experts from NoVirus.uk, potentially unwanted programs, including fake system optimization tools, distribute very commonly through other regular software. This deceptive marketing method is known as “bundling”. The PUP and all its components get installed into the computer system secretly with other programs that the user downloads from the Internet. If you are wondering, how to protect yourself from such activity, you should know that it is necessary to pick the Custom/Advanced installation option over the Quick/Recommended one. When you do that, you will be able to track all incoming downloads and opt-out the questionable-looking ones. Moreover, every single user should run an antivirus program on their machines. Do not hesitate to invest in a truly reliable one and once you download the tool, make sure you keep it regularly updated. This is necessary if you want the anti-malware tool to protect the computer system properly. To remove Power System Care, you will need to download and install trustworthy software. Such tools will help you to deal with the cyber threat in a few minutes and ensure you that the entire process will be done safely and effectively. We recommend this method over the manual one as the user himself/herself might not be capable of detecting all unwanted components that were hidden in the system by the potentially unwanted program. After you take care of the Power System Care removal, make sure you check all browsers that were infected by the PUP. Ensure that you get rid of all browser-extensions, plug-ins, add-ons, and other suspicious-looking content that you didn't add. Moreover, take precautionary measures to avoid secret PUP infiltration in the future every time you browse the web. Here, look for Power System Care or any other recently installed suspicious programs. Wait until you see Applications folder and look for Power System Care or any other suspicious programs on it. Now right click on every of such entries and select Move to Trash. When in the new window, check Delete personal settings and select Reset again to complete Power System Care removal. Once these steps are finished, Power System Care should be removed from your Microsoft Edge browser. Here, select Power System Care and other questionable plugins. Click Remove to delete these entries. Now you will see Reset Firefox to its default state message with Reset Firefox button. Click this button for several times and complete Power System Care removal. Here, select Power System Care and other malicious plugins and select trash icon to delete these entries. Click Reset to confirm this action and complete Power System Care removal. Here, select Extensions and look for Power System Care or other suspicious entries. Click on the Uninstall button to get rid each of them. Now you will see a detailed dialog window filled with reset options. All of those options are usually checked, but you can specify which of them you want to reset. Click the Reset button to complete Power System Care removal process. ^ Pop-Up Ad. Techopedia. IT encyclopedia. ^ NoVirus.uk. NoVirus. Spyware news. ^ Vangie Beal. PUP - potentially unwanted program. Webopedia. IT definitions. 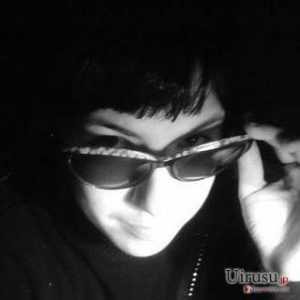 This entry was posted on 2019-04-01 at 15:19 and is filed under System tools, Viruses. You can quickly scan the QR code with your mobile device and have Power System Care manual removal instructions right in your pocket. How did you remove Power System Care?